property-search - Vista Casas Real Estate S.L. 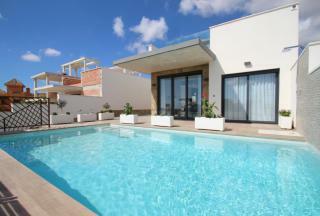 A stunning modern 4 bedrooms, 5 bathrooms villa from the developers exclusive Signature range of Properties. A blend of high-end finishes, excellent materials and timeless design. This modern villa design highlights the use of minimalism, striking angles, open layouts and spaces that seamlessly fuse indoor and outdoor spaces. 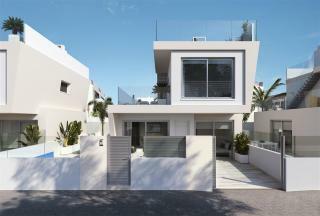 Executive one-off new villa being built only 150 metres from the beach in La Zenia. This impressive home of 292m2 boasts 4 bedrooms and 5 bathrooms, plus office/study, lots of terraces and private roof solarium, private pool. 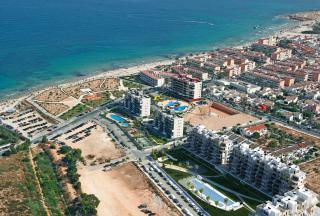 Excellent location just a short walk to the beach and commercial area with its bars, restaurants, shops and supermarket. 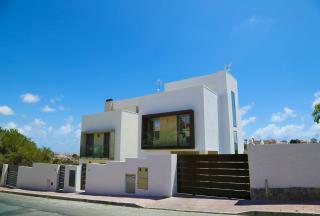 Vista Casas presents a fantastic Key Ready New Build Villa located on a small development of 45 villas in San Miguel De Salinas, offering spectacular views of the Orihuela Costa. A 3 storey villa of 193m2 build plus terrace, on a private plot of approx 382m2 including a 7x4 private pool and a 160m2 basement. Only a 10 minute drive to a selection of fantastic beaches and golf Courses. Luxury off-plan Villas of 4 bedrooms, 3 bathrooms with private pools situated in an elevated location a short walk to the beautiful sandy beach and marina of Campoamor. 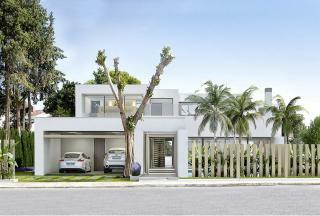 This 4 bedrooms, 3 bathrooms Lea model is 134m2 build on a private plot of minimum 500m2. Enjoy lots of outside space including roof solarium of 58 m2. 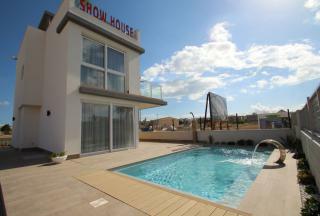 A small development of luxury detached Villas, with private pool in Torre del Moro, Torrevieja, one of the most sought after areas Costa Blanca, near the sea, a few minutes from the beach of la Mata and close to all services. Top quality materials used throughout. Luxury new build Villas with private pools situated in an elevated location a short walk to the beautiful sandy beach and marina of Campoamor. This 3 bedrooms, 3 bathrooms Gemma model is 92m2 build on a private plot of minimum 500m2. Enjoy lots of outside space including roof solarium. Last Remaining Penthouses- 3 bedrooms, 2 bathrooms luxury Penthouse Apartments of 85m2 with sea views only 200 mtrs to the beautiful sandy beaches of Mil Palmeras. Large 25m2 terraces overlooking the communal gardens and swimming pools. 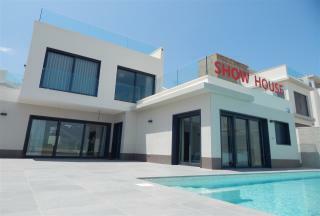 81m2 private roof solarium with Jacuzzi. There is a childrens playground and a gym. Vistacasas are proud to offer the last remaining 3 Penthouses which are key ready for immediate occupancy. Vista Casas presents a small development of 10 villas situated in San Miguel De Salinas, offering spectacular views of the Orihuela Costa. 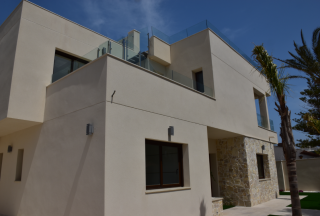 A 2 story level villa of 157m2 build plus terrace, on a private plot of approx 335m2 including a 7x4 private pool. Only 10 minute drive to a selection of fantastic beaches and Golf Courses. 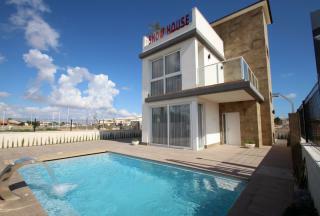 A new release of beachside detached villas. This small development consists of 18 independent villas with private pool, large terraces and private roof solarium. Fantastic location only 250 metres from the beautiful sandy beaches of Mil Palmeras and walking to the amenities; shops, bars and restaurants. Vista Casas Copyright. All Rights Reserved.